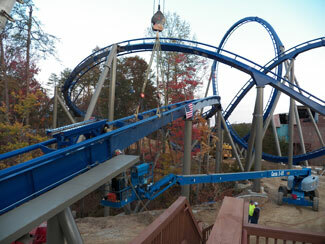 Dollywood’s Wild Eagle is one of the most anticipated attractions for the 2012 season. The B&M Wingrider has been quietly, andcertainly quickly chugging along with construction and, what may come as a surprise to some, track work was recently completed. The final piece was lowered into place last week. These B&M’s seem to fly up in no time! Leave your Park Thoughts below! DISCLAIMER: Park Thoughts and its parent company, 1scream, LLC, are not officially related to the attractions, manufacturers, companies or their sponsors mentioned on this website. All content on this website is strictly the individual opinions of their respective writers. No damage is intended. Some items on this website may be subject to copyright.